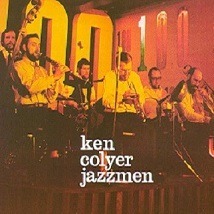 Born in Great Yarmouth, Ken Colyer became one of the leading lights in Britain’s traditional jazz revival. He’d been playing trumpet in The Crane River Jazz Band, Chris Barber’s band (with Lonnie Donegan) and leading his own band since 1949 when he signed to President twenty years later. In 1951, to satisfy his need to be authentic when it came to his music, he joined the Merchant Navy with the intention of getting to New Orleans. After a year touring the world, he finally made it and played with and learnt a lot from some of the top players in the Crescent City over a further four months before returning to the U.K. in 1953. Ken Colyer’s band with a line-up that included Johnny Bastable (banjo), Bill Cole (bass), Tony Pyke (clarinet), Malcolm Murphy (drums) and Geoff Cole (xylophone) made four LPs for President Records’ U.K. Joy label, one of which “Watch That Dirty Tone Of Yours – There’s Ladies Present” was recorded ‘live’ at The Thames Hotel, Hampton Court in 1970. The others were “One For My Baby” in 1969 and “Spirituals” (volumes 1 and 2) in 1974.